I feel so blessed to have the gift of friendship in my life, and what a wonderful gift this would be for that special friend in your life. 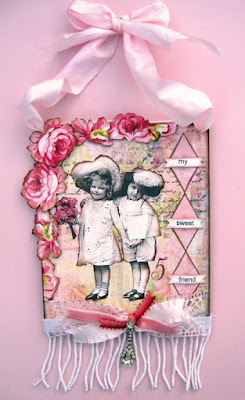 I found this pretty collage over at Kathy Jacobson Designs on Lollishops. It's perfect for that special friend in your life who shares your love of all thinks pink and Shabby Chic. It's adorned with a silk bow and sells for $18.